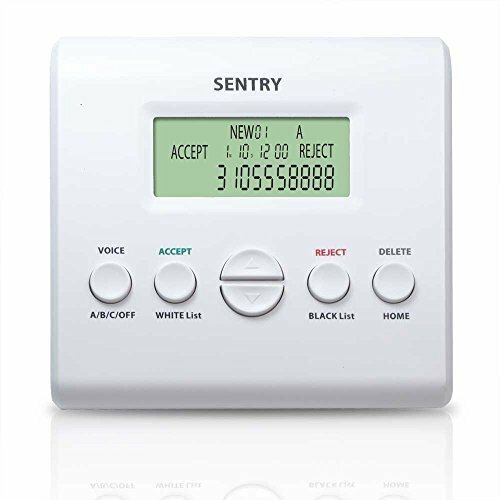 SENTRY 3.1 Call Screener, smart active blocking, block all solicitor calls, election calls, robo calls. 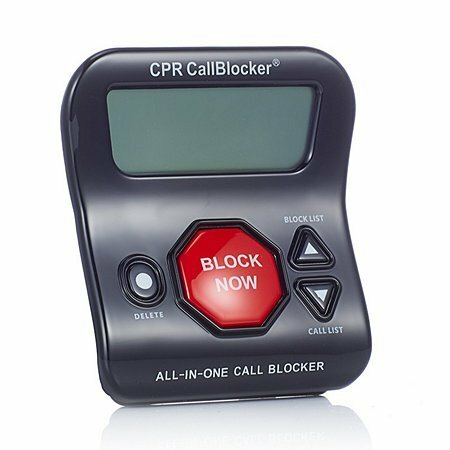 CPR's Premium Level Call Blocker Puts You Back in Control Of Your Privacy With The Latest In Call Blocking Technology. Block All Rob calls, Insurance Calls, Scam Calls, Unwanted Political Calls On Your Home Phone At The Touch Of A Button! Block Now - The Big Red Button: The V10000 can be set to run in BLOCK NOW mode where Call Blocking is actively controlled by the user. V10000 is pre-programmed with 10000 numbers which are 'deemed' as known nuisance rob callers. At the touch of a button the unwanted caller s number is logged into the unit s memory. This feature allows you to block up to 2000 unwanted callers. Dual Mode: The V10000 can also be set to run in ALLOW NOW mode where all numbers are blocked apart from numbers that have been programmed into the ALLOW NOW list (#) 2 Blocking Function: Block a number by entering # 2 (Pound 2) on any cordless handset connected to the telephone base. Pre-loaded Nuisance Rob call Database: CPR Call Blocker V10000 has been pre-loaded with 10000 of the worst offending nuisance rob call numbers. This helps provides a dramatic reduction in rob calls, scam calls, political calls, election calls and general nuisance calls as soon as the Call Blocker is connected. 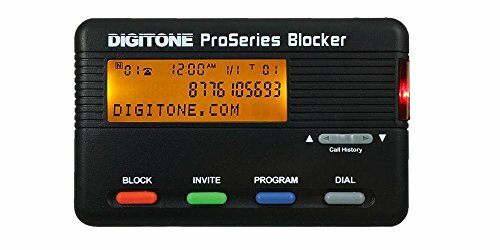 The new ProSeries Blocker was designed by Digitone Communications for those who want a way to block unwanted calls, yet allow all others to ring their phones. It comes from the factory preset to allow all callers with a valid phone number to ring through and then screens your calls based on a Blocked Caller List you prepare. You don't have to prepare a white list unless you intend to block all callers and just let friends and family ring through. 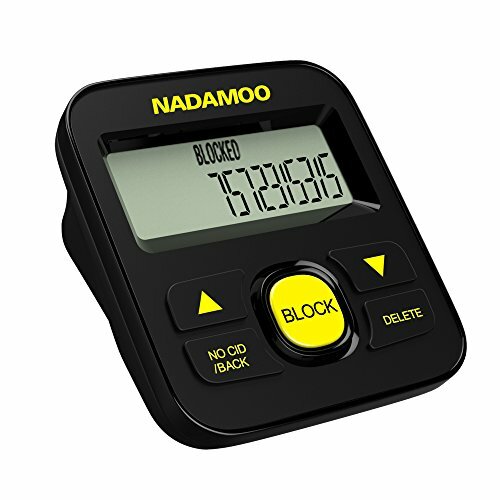 The ProSeries Blocker is the perfect complement to Nomorobo service to prevent the first ring on blocked calls. Caller ID is repeated to your connected phones in the TEL phone port on all invited calls. More information can be seen at digitone.com or call 1-877-610-5693. Make sure you have a secure delivery location before ordering. Contact Digitone at 1-877-610-5693 before purchase of the Digitone ProSeries Blocker to discuss your plans to connect it to your phones or visit Digitone's website. Please read through the manual before usage of the product or for troubleshooting steps. Thank you. WINNER of CONSUMER REPORTS ROBOCALL BLOCKER Review. FREE USA Domestic Shipping! Call us at 877-610-5693 to discuss your plans to use our product or visit digitone.com. Compatible with Cox, Comcast, Xfinity, ATT Uverse, Ooma and many others frequently requested. An Amazon Best Seller! 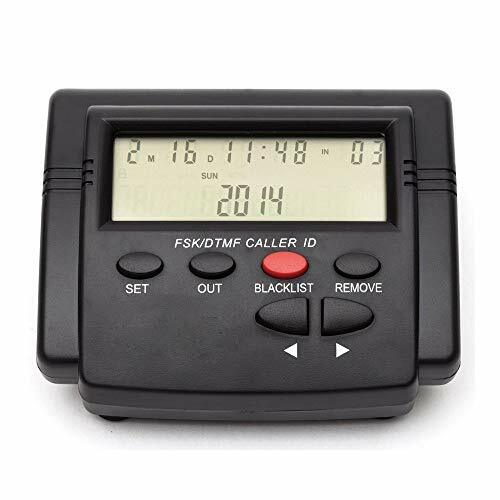 BACK-LIT 3 Line Display that shows NAME and NUMBER, Time, Date, Total and New Calls. Please read through the manual before usage of the product or for troubleshooting steps. The ProSeries has its own power adapter and wall mount plate. Newly Patented Technology! Your Phones Won't Ring on Blocked Calls. Caller ID is Repeated to your connected Phones. Virtual Unlimited Block Memory. No need for a Line splitter or worry of static on the Line. Works on all ANALOG phone lines with DSL, FIOS, Cable Modems or Phone Company Services that provide ANALOG phone ports. Block Entire Area Codes, Exchanges or Specific NAMES or NUMBERS. Block V or + type name calls or SPAM? identified calls from Verizon. Note: Business digital type DHCP-VoIP Key sets that require an IP address are not compatible with the ProSeries Blocker. Stop Calls Instantly with One Button Blocking as they Ring In. Requires Caller ID Name and Number Service. Use Last Call Remote Entry on your Phone to Block Calls Remotely. Sick and tired of robocalls or sales call from telemarketer? Be plagued with annoying political call, fake charity call, or poll call? The device is connected directly to landline phone via line cable (no extra software or drivers demand). When a call comes in and the customer doesn't want to answer it now and after, the customer can add the number to the device's block list. THIS FUNCTION IS THE SAME WITH BLOCK LIST ON THE CELL PHONE. After blocked, the number (communication signal) can still reach to the customer's landline phone later, but the device will identify the number from the block list and hand up the phone automatically. Sentry is a check point to screen all incoming calls. Create White List. Your loved ones will pass through Sentry without checks. Sentry 'check point' has two lines of defense. First is a voice warning message, that tells solicitors to leave, and tell legitimate callers to come in by pressing 0. The second line of defense is SENTRY's Black List function. You can put any number on sentry's caller id list to the Black List. Set up Whitelist (friends and family) with keypad. (New feature) REQUIRES Caller ID service. Brand: Tel-Sentry Inc. | Manufacturer: Tel-Sentry, Inc.
Large storage capacity: block all unwanted calls, cold calls, telemarketing calls, political calls, up to 4000 sets numbers. Block unknown numbers: This box adopts high-tech technology, and it will analyze the calls before signal pass to phone. Block all no ID calls. Pre-programe blacklist numbers quickly: creat blacklist numbers easily and quickly. To operate blocker with an easy manual . Quick and easy operation:Say goodbye to cheater, don't worry elder will be cheated. (1)Press " / " to check those incoming calls, press the red button "BLOCK" for the unwanted numbers and "SAVE-SUCCEED" will show on the screen. (2)When answering phone calls, press"*" on your phone until "SAVE-SUCCEED" on the screen of the blocker. (3)Pick up the phone handset, press"** + phone numbers + #"Until "SAVE-SUCCEED" shows. 2.How to remove numbers from blacklist? Press "BLOCK" button on blocker, and then press " / " to check the blacklist. Press "DELETE" twice quickly until "SAVE-SUCCEED" shows. 3. How to delete all Incoming Calls? Press " / " to check unwanted numbers, Press "DELETE" twice quickly to delete a number, but press "DELETE" for 3 seconds to remove all incoming calls after "DONE" shows on the screen. 4.How to Block NO CID Calls? Press "NO CID/BACK", use " / " to choose "ON/OFF", press "NO CID/BACK" to save. all calls with NO CID will be rejected directly. 5.The device does not display the name of the caller. If you blocked a number accidently, just need to press the red button, then press the / key to find the number, and press the delete key twice to do it. Smart call blocker Easy selection of "blacklist" & "whitelist" numbers to block/allow the correct callers, block robocalls, sales and annoyance calls effectively. ONE-TOUCH blocking Simply hit big BLOCK button to stop all unwanted calls, Don't require any set up, extremely easy to use. 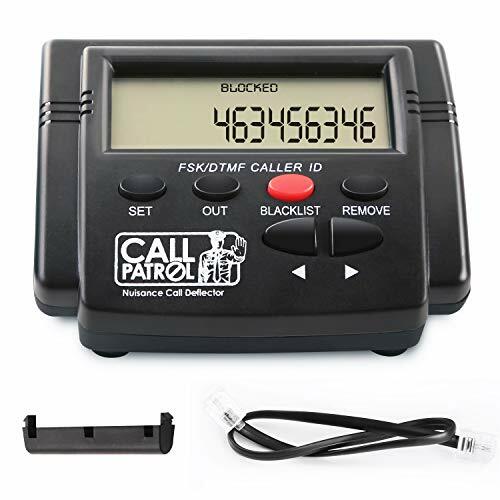 Large internal capacity The call blocking device come with 4000 number capacity, filter all incoming calls without caller ID, out of area, unknown area and private calls automatically. Worldwide Compatibility The phone call blocker compatible with 99% USA landline. Such as: AT&T, Comcast, VTech, Philips, Panasonic, Uniden and so on. Crazy and annoying about the robocalls, sales calls? Hate to be interrupted by nuisance and spam calls when working? 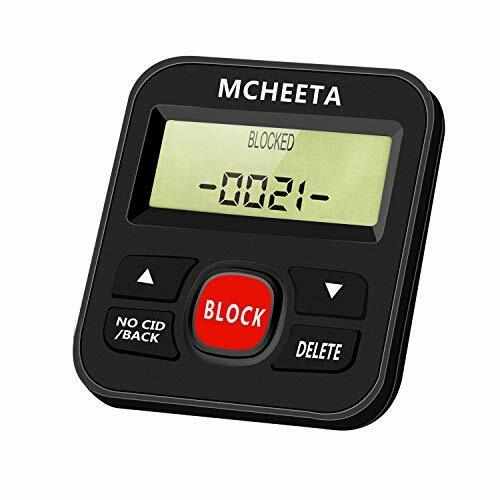 MCHEETA CT-CID803 CALL BLOCKERS devote to protecting your privacy. Say good bye to all unwanted calls at one touch of the red block button. Caller ID service and a phone line are required for the device to work. The device will not show the name of the caller. Slim Body with High Capacity: the small device can block up to 4000 numbers. No Extra Battery Required: the device is phone line powered, and parallel set up can be considered if more than 5 devices. (1)Unplug the phone line from your phone and insert it to the line port of call blocker. (2)Connect the call blocker and your phone with the short cable provided. The phone call blocker is compatible with 99% USA landline providers and landline phone manufacturers. (1)While the call is active, press the "BLOCK" button. (2)Review the calling list by press the " / " buttons at home page, press the "BLOCK" button. (3)Pick up the phone handset, press "*" TWICE, enter a phone number, and press "#" to block it. (Based on the Phone). How to review and delete blocked numbers? Press the "BLOCK" button, then use the " / " buttons. Numbers are stored in numerical order. To delete a blocked number, press the "DELETE" button twice, then back. How to get back to factory setting? Pick up phone handset, press "*", then enter "61806180", press "#" key to exit. Lifetime Warranty is guaranteed, welcome to contact us freely to get help if any issues. One Touch Blocking The call blocker device blocks area codes, no caller ID calls, nuisance, scam, political, survey calls, robocalls at one touch of the red block button. 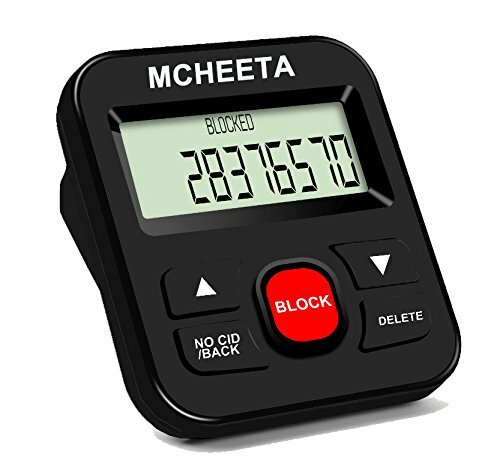 High Capacity Block up to 4000 numbers easily with this phone call blocker. Press block button first then click / to view your blocked list. Worldwide Compatibility Compatible with most major USA landline providers/ landline phones. Caller ID service is required from your network provider. 100% Satisfactory Lifetime warranty is provided for ODSEN call blocker for home phones. Contact us freely. How to block the number you do want? When you pick up the phone call and the number is shown on the device display, press the "BLOCK" button. While picking up your phone and the caller ID is shown on your phone handset, press * twice. Review the call log on the device by using the " / " button. Press the "BLOCK" button to add a displayed number to the blacklist. Add numbers into the blacklist, use the phone handset, press speakerphone, press * twice, enter a phone number, then press # to exit. Note: Press * on your handset, use " / " button on call blocker rather than handset. How to Review & Delete Blocked Numbers? Please hit "BLOCK" button first, then use " / " button on the phone blocker to review the blacklist. Delete the displayed number, click "DELETE" set twice. How to block area codes? How to block NO CID calls? Press "BACK/NO CID" button first, then use " / " button to toggle the NO CID on or off. Press BACK when done. The phone blocker required caller ID display service for device to work. Device do not display the name of caller. One-touch Blocking This device blocks area codes, no caller ID calls, nuisance, scam, political, survey calls, robocalls at one touch of the red block button. 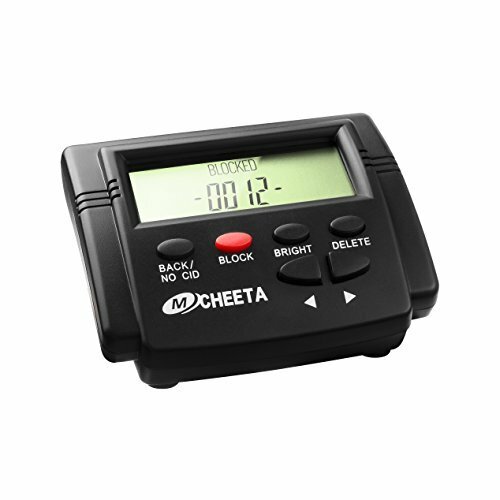 2000 numbers Capacity Block up to 2000 numbers easily with this phone call blocker. Suitable for family and office.Press block button first then click / to view your blocked list. Easy to Install The slot TO PHONE is connected to your telephone.TO LINEis connected to the telephone line.Highly safety device with the weak current.Powered on telephone line.No power supply required. The call data won't lose even power off. Five-step brightness adjustable The screen brightness of the call blocker is adjustable for different light. 100% warranty 12-month warranty. If any questions during using our caller blocker. Please contact our after-service team via email. Call Blocker for Landline Phones, Nuisance Phone Blocker with Big Block Button. Robo Call Blocking Device, Block All Sales Calls, Scam Calls and Unwanted Calls. If you are getting bombarded by non-stop calls from people trying to sell you stuff, or trying to trick you into giving them your money, then you need to get this Call Blocker---the best solution available in the market to block unwanted calls and protect your privacy. :) Very easy to operate with manually add blacklist function, it is a function that prevents yourself from being harassed and intercepts harassing text messages and calls. When you don't want someone or someone to contact yourself, you can set his number to the phone blacklist. When the number on the list calls or texts you, the phone and text message will be blocked. But you can also see the numbers. :) There is no fees for using it; Manual also have been updated to a improved one with better English directed. :) Block up to 4,000 individual phone numbers ( including incoming and outgoing calls ). :) Permanent storage of the numbers in the blacklist even power is off or telephone line is plugged out. required (uses the power from your existing phone line). Block all unwanted nuisance calls & unknown calls(with NO CID). Can be perfectly adapted to your landline phone. *Stores numbers in numerical order. data won't lose even power off. Large and clear display screen, 5 brightness levels. By adding a area/country code, you can block all numbers from this area or country. Block Area/Country Codes By adding an area/country code, you can block all numbers from this area or country. Unveil a New Stage of Quiet Life Phone Blocker will help to bring peaceful and quiet to your home as well as relieve the stress and anxiety associated with nuisance calls. 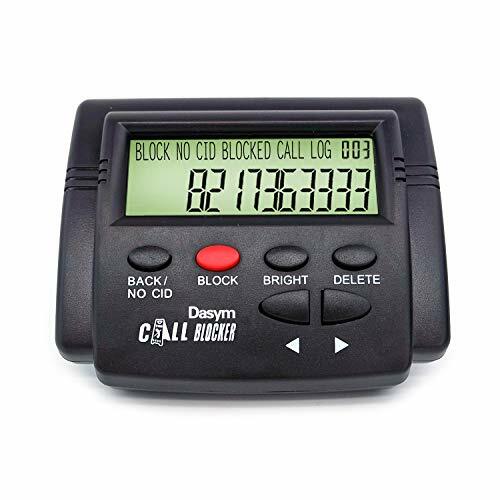 Visual Look and Feel Improvements Our landline phone Call Blocker features a clear caller display screen, large red Block button, make it more convenient and easy to operate. Perfect customer Service We provide 12-month warranty and 45 days money back, also provide exceptional After-sale service to ensure the enjoyment of your purchase. Say No More To Rob calls, Political Calls, Scam Calls, Unwanted Calls, Nuisance Calls, Telemarketing Calls: Block All At The Touch Of A Button! 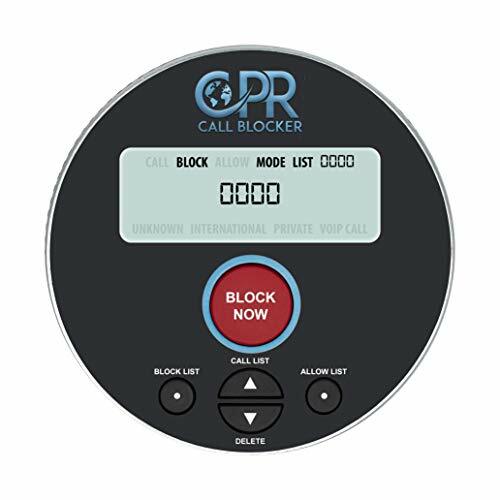 The newest CPR V2000 Call Blocker features a 3 Inch caller display screen, large "Block Now" button, 3500 number capacity and has the ability to block unwanted callers from Cordless DECT extension handsets by pressing #2. 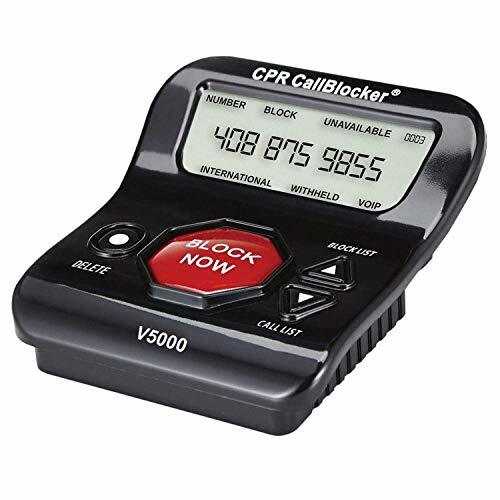 V2000 Main Features: Easy To Use Controls: With CPR Call Blocker's easy to use control buttons you can view the callers number on its large 3 Inch display and view the blocked number list as well as see how many times that Blocked number has tried to recall. If required blocked numbers can be easily removed from the block list using the delete button (See Images above). Built in Number List: The CPR Call Blocker is pre-programmed with more than 2000 numbers which are 'deemed' as known nuisance callers. Companies which are selling by phone, using overseas call centers and automated sales lists are all pre-programmed which will minimize the sales calls you receive almost immediately. Block Now Function: The Block Now button is located on the top of the unit. At the touch of a button the unwanted caller s number is logged into the unit s memory, the call will hang up and the number blocked permanently. This feature allows you to block up to 1500 unwanted callers as they are calling you. #2 Blocking Function: Block a number by entering #2 on any DECT handset connected to the telephone base. Manual Entry: Manually enter or remove numbers to/from the Blocking list Compatibility: Compatible will all major US line providers including AT & T, Comcast, Ooma, Verizon, Century Link, Frontier etc. CALLER ID SERVICES FROM YOUR NETWORK PROVIDER IS REQUIRED FOR THIS PRODUCT TO WORK. Do you hate it that even after installing a call blocker, you still get spam calls from unrecognized numbers? If you do, try SENTRY. 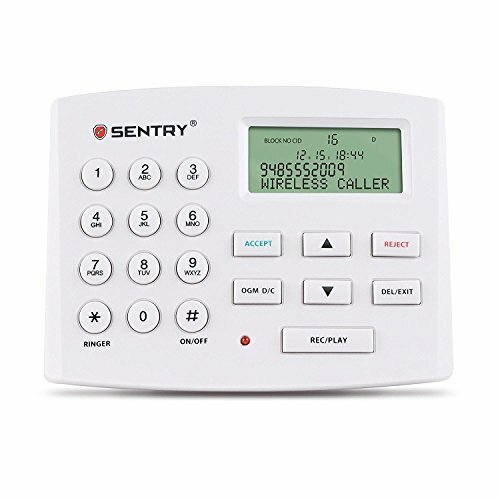 SENTRY works like a real sentry guarding your house phone. It recognizes the friendly numbers (White List) and let them in, it recognizes spammers (Black List) and hangs up on them. For unrecognized callers, it will perform 'Stop and Check which will let in the good callers and drive away the bad callers. This unique Active Blocking will block 100% robo junk calls and 99.9% of telemarketer/solicitor calls. All you need to do is to set up a White List, that includes your friends and family members, doctor offices, pharmacies, etc. Once you have the White List set up, SENTRY is fully automatic. There is no need to hit REJECT button anymore. You will no longer be bothered by those annoying telemarketer calls, not even one. And you don't need to do a thing! There is no need to hit REJECT button like most other call blockers. Worried about missing important first time calls? SENTRY allows first time callers to press 0 and ring the unit so you can pick up the call. By pressing 0 the caller's number is automatically saved to the White List. If you are not ready for the Active Blocking, SENTRY can be used as a conventional call blocker with Black List. You can choose to have SENTRY to block based on Black List only. SENTRY has a Black List capacity of 1500. Please watch SENTRY intro video for more details. Preload White List at set up. Requires Caller Id Service. Brand: Tel-Sentry Inc. | Manufacturer: Tel-Sentry Inc.
Say No More To Rob calls, Political Calls, Scam Calls, Unwanted Calls, Nuisance Calls, Telemarketing Calls: Block All At The Touch Of A Button! 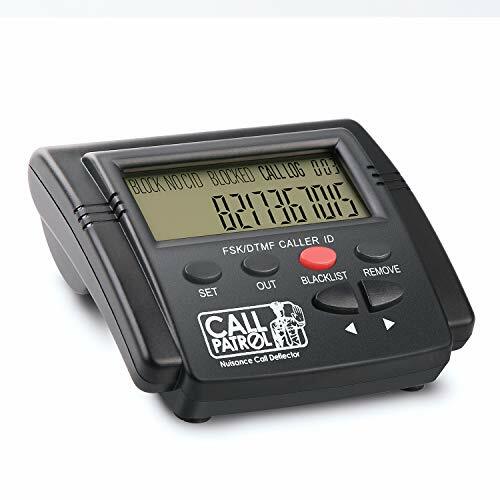 The newest CPR V2000 Call Blocker features a 3 Inch caller display screen, large "Block Now" button, 3500 number capacity and has the ability to block unwanted callers from Cordless DECT extension handsets by pressing #2. 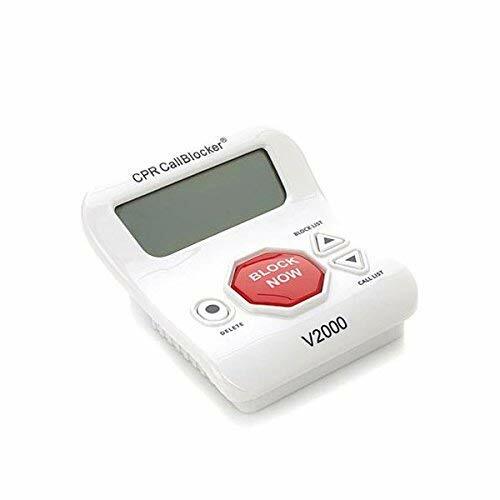 V2000 Main Features: Easy To Use Controls: With CPR Call Blocker's easy to use control buttons you can view the callers number on its large 3 Inch display and view the blocked number list as well as see how many times that Blocked number has tried to recall. If required blocked numbers can be easily removed from the block list using the delete button (See Images above). Built in Number List: The CPR Call Blocker is pre-programmed with more than 2000 numbers which are 'deemed' as known nuisance callers. Companies which are selling by phone, using overseas call centers and automated sales lists are all pre-programmed which will minimize the sales calls you receive almost immediately. Block Now Function: The Block Now button is located on the top of the unit. At the touch of a button the unwanted caller s number is logged into the unit s memory, the call will hang up and the number blocked permanently. This feature allows you to block up to 1500 unwanted callers as they are calling you. #2 Blocking Function: Block a number by entering #2 on any DECT handset connected to the telephone base. Manual Entry: Manually enter or remove numbers to/from the Blocking list Compatibility: Compatible will all major US line providers including AT&T, Comcast, Coma, Verizon, Century Link, Frontier etc. CALLER ID SERVICES FROM YOUR NETWORK PROVIDER IS REQUIRED FOR THIS PRODUCT TO WORK. BUY DIRECT FROM US, THE MANUFACTURER, AND RECEIVE LIFETIME TECHNICAL SUPPORT. TelPal Call Blocker is quick and easy to set up, plug your phone into Call Blocker and then plug Call Blocker into your phone socket. Powered by your phone line, there's no need for plugs or batteries and it can be wall mounted or left free standing. Call Blocker works on any home phone line, even if you have more than one handset and broadband. Block up to 1000 numbers quickly and easily with One-Touch Call Blocking. When your phone rings, the display shows you the number calling. If you recognize the number as a nuisance caller, you can block them without answering the phone by pressing the Blacklist button. If you're not sure who it is, answer the call and if it's someone you don't want to speak to, press the Blacklist button to end the call and add their number to the blocked caller list. If you already have a list of numbers that you want to block, you can use your phone to add these numbers to the blocked caller list. Once a number has been blocked, there's no way they can get through to you and your phone will not ring. Don't worry if you block a number by mistake, you can easily unblock/remove any number. You also have the option to block withheld numbers and up to 10 area codes from calling you. For example, block all numbers starting with 08, 03 or any other dialing code you don't want to receive calls from. Call Blocker's Parental Control allows you to block up to 100 outgoing calls to mobile or premium rate numbers. Call Blocker can be PIN protected, to stop anyone from changing your settings. You can view the last 100 incoming calls and the last 50 outgoing calls and block any of these numbers by pressing the Blacklist button . It is the latest Version for Call Blocker Pro; Hidden numbers, private and unavaialble call numbers can be blocked. High Volume Blocking Capacity: BLACKLIST up to 1,500 unwanted phone numbers, area codes and prefix numbers. One-touch Block:It's easy to install & use - simply setup and start blocking numbers! 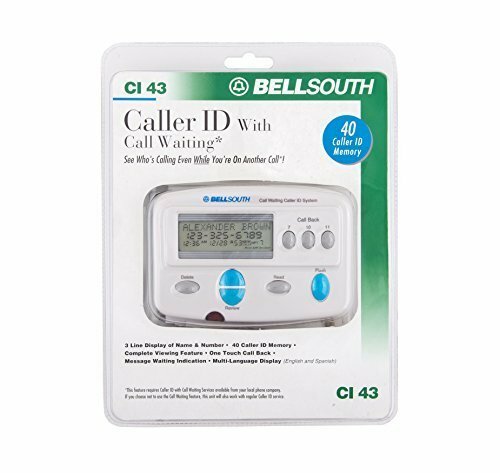 Compatible with Existing Phone Services:It works on landlines (PSTN, POTS), Analog/Digital/Internet (VOIP) Voice lines;Attention: Not Compatible with Cordless Phones & Two Line Phone systems, especially AT&T Phones !! Great Relief from Unwanted Callers; Getting Quiet and Giving us Back OUR Phone! 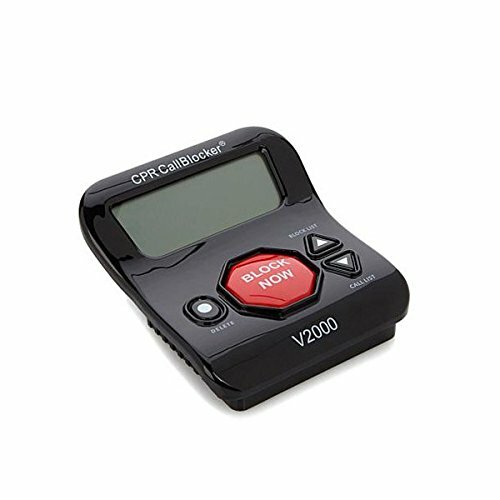 Block up to 1000 numbers with the CPR V202 Call Blocker. Pre-loaded with 200 of the worst offending numbers - Companies which are selling by phone, using overseas call centers and top robocalls are all pre-programmed which will minimize the unwanted nuisance calls you receive almost immediately. You can block a further 1000 numbers at the touch of a button. We believe the home phone to be an instrument for communication not frustration, the CPR V202 Call Blocker will help bring back peace and quiet to your home as well as relieve the stress and anxiety associated with nuisance calls. Despite the government efforts with programs such as the Do Not Call list, unwanted telemarketers continue to ring home phones several times a day. In addition, loopholes to the Do Not Call rules, permit charities and political organizations to continue calling even if your number is on the 'Do Not Call' list. Easy to Blocked blacklist numbers,which to block the correct callers, block robocalls, sales and annoyance calls effectively. FCC Certified; -Do I need caller ID service active in my phone line in order for the Call Blocker to work properly? Yes, this device requires caller id service from your phone service. -Do I need one Call Blocker to protect each phone in my house? You only need one Call Blocker to protect your phone line (or phone number). -Can I use the Call Blocker to block calls to my cell? The Call Blocker works on landline, not mobiles or cell phone lines. However, you can forward your cell calls to your landline and use the Call Blocker to block the cell calls. Capacity 1500 numbers, support area number block. It could block all unwanted Phone Calls, Spam Calls, RoboCalls, Nuisance Calls, Telemarketing Calls, Private Calls and International Calls. One button to add unwanted number to blacklist. Give you a convenient and efficient experience. You could also remove someone from blacklist to white list easily. Easy to install and use, don't need any battery or external power. The call data will exist even power off. Compatible with almost mainstream landline phone, including almost single line telephone, but not including Bright Phones, Two Line phones and AT&T Phones. 12 month warranty. If there is any question about the blocker, please don't hesitate to contact us.